IGUALA, Mexico -- The previous elected mayor is in jail, and the new one wants to "turn the page" on the ugliest chapter in the history of this southern Mexican city. 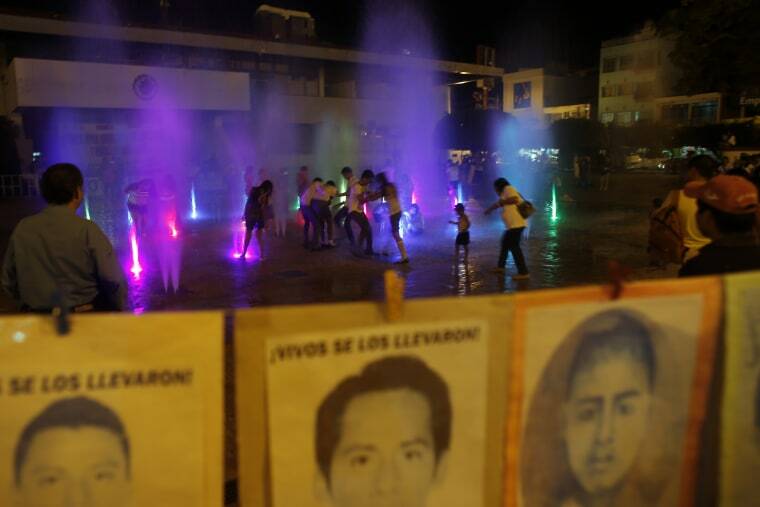 Fifteen months ago, when 43 rural college students disappeared at the hands of local police and cartel thugs, Iguala became the symbol of Mexico's narco-brutality. Now, federal police are in charge of security, the ruling Institutional Revolutionary Party controls city hall - and Mayor Esteban Albarran Mendoza wants to move forward. "Ask the businesspeople, ask the cab drivers, the housewives, those who live daily here in the city, what they are enduring right now ...," Albarran said. "There is anxiety. There is not peace. There is not security. We want to turn the page on all these kinds of things." But how can this city move on when, according to a local newspaper's count, there were five murders during Albarran's first week in office, and 25 in his first two months? Disappearances continue, and most of the missing have not been found. For hundreds of families around Iguala there is no possibility of turning the page as long as they have no proof of death or a body to mourn. On Tuesdays, they gather in the San Gerardo church basement to listen to the new numbers from the attorney general's office: bodies found, bodies identified, bodies returned to their families. Most leave without answers and return home to await a call to view photos of clothing or evidence of a genetic match. While seeking resolution of old horrors, there are new ones. Zenaida Candia Espinobarro already spent her Sundays with other families searching the mountains around Iguala for hidden graves, looking for the remains of a son who disappeared two years ago. In the town were 43 students disappeared at the hands of police and cartel thugs, the new mayor wants to 'turn the page.' But there were 5 murders during his first week in office. But while she was looking for the bones of one son, she lost another: Armando Velazquez Candia was shot by two men on a motorcycle in front of his girlfriend's house the afternoon of Oct. 26 and died 10 days later. Along with the bloodshed, the drug trade goes on. Despite the presence of federal and state police, and the military, there is no sign that trafficking has abated around Iguala or elsewhere in Guerrero state - a producer of marijuana and opium paste for the U.S. heroin market. Again this month, state and federal officials promised to secure Guerrero and eradicate more poppy fields, recognizing that efforts of the past year had little impact. Not that Iguala is unchanged. Former Iguala Mayor Jose Luis Abarca Velazquez was arrested and charged with murder in connection with the disappearance of the 43 students, and 66 police from Iguala and neighboring Cocula have been jailed. Authorities have disbanded the local police force that allegedly turned the students over to the Guerreros Unidos drug cartel, which officials say was closely allied with Abarca. Albarran, 47, was sworn in as mayor on Sept. 30. He has fine plans: a transparent government, a growing and more prosperous city. But he acknowledged at a news conference this month that Iguala remains insecure. "Exactly one week ago I was saying ... that we had nine, 10 days when nothing happened," he said. "And disgracefully, unfortunately that same day at 5 p.m. and 7 p.m. two terrible situations occurred." The first victim that evening was a taxi driver shot multiple times in his car by men on a motorcycle, according to the local newspaper El Sur. The second, a 14-year-old boy, was shot repeatedly an hour later, just a block from the San Gerardo church where many families of the disappeared have met weekly since November 2014. Albarran said recent killings have been "very targeted" - a euphemism government officials use to suggest the victims were involved in illegal activities and likely murdered by rivals. He also noted that Iguala's violence is less than in larger cities in the state, such as Acapulco and the state capital of Chilpancingo, "where crime is out of control." From January to October, murders in Iguala were up 25 percent from the same period the previous year, with 81 deaths among a population of 150,000. In the once glamorous beach resort of Acapulco, 751 people were killed - a 59 percent increase. Mexican Interior Secretary Miguel Angel Osorio and the national security cabinet travelled to Iguala this month to open a new intelligence center and pledged continued government support for the state. That day, across town, a woman and her two young children were taken from their home near an army checkpoint by heavily armed men. The mother, shot twice in the head, was found dead the following day. The children were added to the ranks of the 26,000 people who have disappeared in Mexico since 2007. Ten other disappearances in Iguala have been reported to authorities since the 43 students vanished, according to the government's registry. But since few people report such incidents when they happen, the actual number is likely much higher. Meanwhile, residents adapt in ways large and small. Leticia Salgado Pedro, an elementary school teacher, no longer wears a helmet when riding her motorcycle - better to risk being hurt in a traffic accident than to be mistaken for a hit man's target. Her neighbors stay at home now, especially at night. "The people who used to go out to drink, mostly young people, don't do it anymore, they don't hang out on the corners like before," said Yazmin, who has lost a husband and a brother-in-law. She declined to be identified with her last name. And if Igualans talk about the violence at all, most do so privately. If asked their names they politely decline, "for safety." But the parents of the 43 students are not silent and they continue to protest, demanding to know what happened to their sons. The families of the other disappeared are still coming forward, seeking answers. Until then, they refuse to turn the page.